Solar inverter efficiency refers to: as the demand for renewable energy, solar inverter (photovoltaic inverter ) market is growing, and these inverters require high efficiency and reliability. 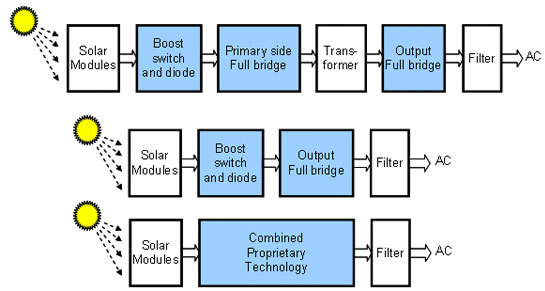 Solar PV inverter general structure is shown as following Figure, with three kinds of inverters for option. Sunlight shine on the solar modules connection in series, each module comprises a string solar cells in series. The direct current (DC) voltage generated by solar module is on several hundred volts, the value is determined by illumination condition, the battery temperature and the modules number. The primary function of solar inverter is converting DC voltage to a stable value. This function is achieved by the boost converter and need a boost switch and boost diode. In the first structure, it's an isolated full-bridge converter after boosting. The role of full-bridge transformer is to provide isolation. The second full bridge converter on output side is used for converting the first full bridge converter's DC into AC voltage. Its output is filtered by an additional double contact relay switch before connecting to AC power grid, the purpose is to provide safe isolation in case of a failure and at night isolate with the power grid. The second structure is non-isolated solution, the AC voltage is generated by DC voltage boosting directly. The third structure is using power switch and power diode to integrate the boost and AC generating functional in a dedicated topology, although the conversion efficiency of solar panels is very low, it's important to make it close to 100%. In German, a 3kW south-facing roof mounted module can generate approx 2550 kWh electricity annually. If the inverter efficiency increase from 95% to 96 %, then it's able to generate additional 25kWh per year. The use of additional solar modules to generate 25kWh electricity will cost as high as an inverter price. Since the cost of the solar inverter won't increase if the efficiency increase from 95% to 96%, so it's an inevitable choice to invest high efficient inverters.